Julie Green (b. 1961 in Yokosuka, Japan) wanted to be a stewardess until age four, but became a painter instead. 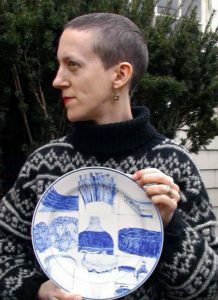 Green’s work has been featured in The New York Times, aWhole Foods mini-documentary, National Public Radio, Ceramics Monthly, Gastronomica, and 7th edition of A World of Art published by Prentice Hall. She has exhibited widely in the United States and internationally. A 2011 recipient of the Joan Mitchell Foundation Painters and Sculptors Grant, Green also won the 2015 ArtPrize 3-D Juried Award and is a 2016 Oregon Arts Commission Fellow. Half of each year, usually in winter months, she works on The Last Supper, an ongoing project about capital punishment in the United States. Green lives in the Willamette Valley and is a professor at Oregon State University. A selection of Green’s My New Blue Friends paintings exhibits in the Governor’s Office in Salem in July and August 2016. She is also included in Portland2016: A Biennial of Contemporary Art, curated by Michelle Grabner and presented by Disjecta Contemporary Art Center.